Pic by winnond editing by me. A few weeks ago on Facebook I mentioned that I would be starting my Homemade/Handmade Challenge again. Some of you joined along last time and I can not WAIT for even more of you to join along this year! The rules are pretty simple, try to make at least ONE thing from scratch/homemade/handmade per week. That's it! Pretty simple huh? It can be anything, food, crafts, cleaners, sewing, etc. To get you started, here is my Master Baking Mix recipe I shared over at Money Saving Queen last year. It is GREAT! I switch between using Butter and Shortening, which ever I happen to have on hand is what I use. I use this in place of a name brand all purpose baking mix that comes in a yellow box with blue writing. ;-) My friend Kristy over at Mommy Hates Cooking came up with a Gluten Free version and has some GREAT recipes you can use either version in. I would LOVE to hear what you guys make each week! I will have a post each week featuring what I made the week before and would LOVE for you guys to leave a comment letting me know what you made. 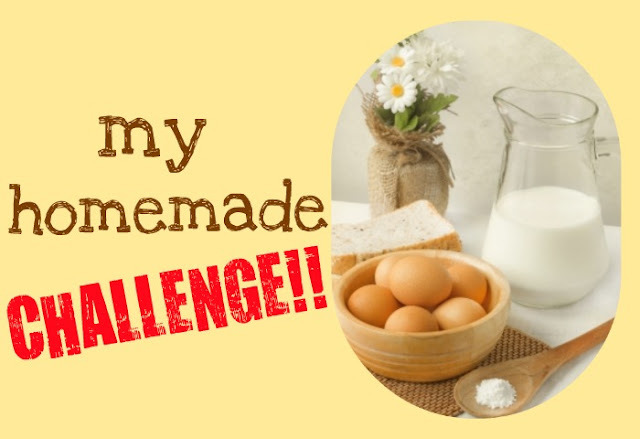 Also, share on Twitter and Instagram with #HomemadeChallenge!